Anyone who's ever had a bottle of foundation leak all over the rest of the products in their makeup bag is going to love this! 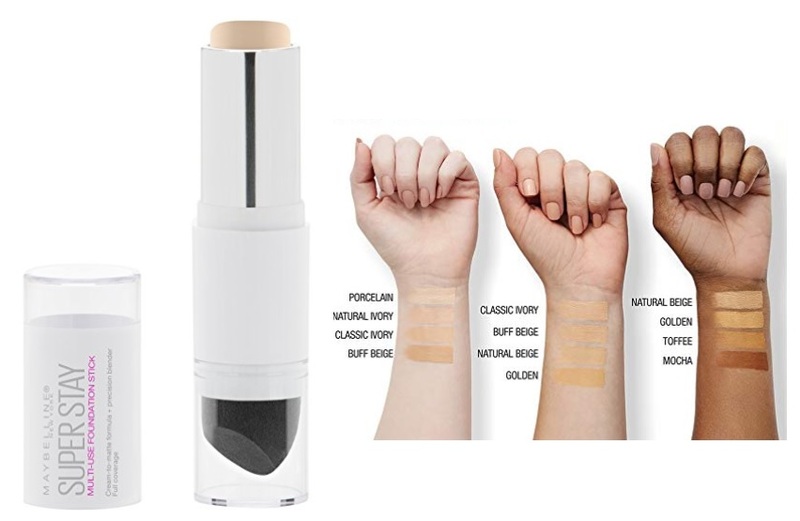 Maybelline SuperStay Multi-Use Foundation Stick - $14.99 - in 12 super-saturated shades: Fair Porcelain, Porcelain, Natural Ivory, Classic Ivory, Buff Beige, Natural Beige, Honey, Golden, Toffee, Warm Sun,Warm Coconut, Mocha - a multi-tasking stick that conceals, contours, highlights and covers with a cream-to-matte finish and pointed blender sponge for easy and quick application at home or out on the town. Perfect for taking on vacation, to the gym or just throwing in your purse for everyday use. I still use my liquid foundation at home in the morning but pull this baby out for afternoon touch-ups, not only do I no longer have to worry about foundation leakage, but I don't have to worry about how to apply, the sponge is right there!